The first thing that you need to know about associations and alcohol is that the liquor laws in Arizona were not written with association’s in mind. As a result, there is often a fair amount of “gray area” in this area of the law. This article will help explain some of the common situations that an association may encounter and how to best handle them. An association hosts an annual “wine and cheese party” where the association serves wine and cheese to its members and their guests. The association charges a minimal fee for the cheese. Is this permissible? The association is prohibited from selling alcohol in any way, without a license. 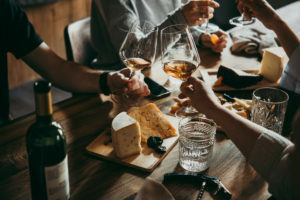 Even though the charge is allegedly for the cheese – the State of Arizona likely will not agree and will presume that the association is selling alcohol at its wine and cheese party, because the association is charging a fee and supplying alcohol to its members. What if the association hosts the wine and cheese party mentioned above, but does not charge for the wine or the cheese? The answer does not significantly change. While the association is no longer selling alcohol (which is at least slightly better than the previous example), the State of Arizona does not permit an unlicensed business (i.e. a business that does not have a liquor license) to serve alcohol. Pursuant to A.R.S. §4-244, it is unlawful to either sell or “deal in” spirituous liquors without obtaining a license to do so, which generally includes supplying/serving alcohol. If the association hosts a few parties each year and it wishes to sell and/or serve alcohol, it should consider obtaining a Series 15 special event liquor license pursuant to A.R.S. §4-203.02 through the State of Arizona. This type of license (which may be available to many associations) allows an association to actually sell alcohol at its premises for up to 30 days, each calendar year. While certain requirements must be met, this option presents a viable alternative for many associations in Arizona. The association’s board of directors wishes to allow the board and homeowners to bring their own beer (BYOB) to help board meetings be a bit less “edgy.” The board does not want to get involved with having a liquor license and is not selling or serving any of the beer. I think that most of us can agree that boards may not make their best decisions after having a few alcoholic beverages. However, if a board wishes to allow BYOB events at its clubhouse, including board meetings, it should carefully consider the potential risks and options available prior to doing so. Pursuant to A.R.S. §4-244.05, any person owning, operating, leasing, managing or controlling a business establishment or business premises which are not properly licensed shall not allow the consumption of alcohol if: (1) food and beverages are sold; (2) entertainment is provided; (3) a membership fee or cover charge for admission is charged; or (4) a minimum purchase or rental requirement for goods or services is charged. While it is debatable whether an association clubhouse constitutes a “business establishment” or “business premises,” and whether annual assessments are “membership fees,” this area of law has not been sufficiently developed to provide associations with clear guidance on this issue. If the Board wishes to allow BYOB events with little risk, it should consider obtaining an Unlicensed Business Establishment Exemption from the State of Arizona pursuant to A.A.C. R19-1-324. If approved, this type of exemption expressly allows an unlicensed business to permit alcohol consumption on its premises. Having this type of exemption also comes with some restrictions, though. For instance, alcohol consumption may only occur between certain hours (4:00 p.m. and 2:00 a.m.) and those consuming alcohol are limited to possessing or consuming no more than 40 ounces of beer, 750 ml of wine, or 4 ounces of distilled spirits. Additionally, no more than 300 people may attend any function where alcohol is consumed. For some associations the above exemption may not prove workable. If the association wishes to allow “BYOB” events or otherwise allow consumption of alcohol on its premises, without a liquor license, or an unlicensed business establishment exemption, it should consult with its attorney as there are some arguments that can be made in favor of this approach if the association is willing to adopt certain positions and accept some level of risk. Clearly, the most risk-free approach is to prohibit alcohol from association premises. However, that is not always feasible in certain communities. Accordingly, each association will have to determine whether it wishes to completely prohibit alcohol, allow “BYOB” consumption, obtain an unlicensed business exemption, obtain a special event (Series 15) liquor license, or obtain a permanent liquor license. There is no “one size fits all” approach. Finally, an association must also consider other issues if it chooses to allow consumption or sale of alcohol on its premises. Does it have the proper insurance? Does it need security? Are the premises safe? Are people driving home intoxicated? Associations must give significant consideration to these issues prior to permitting the consumption of alcohol on-site. This article was written by Mark K. Sahl, Esq. and Javier B. Delgado, Esq. and originally published in the November 2018 issue of Community Resource Magazine by the Central Arizona Chapter of Community Associations Institute. The information contained in this article is not intended to be legal advice and is provided for educational purposes only.